When enemies seem to be lurking around every corner it can be difficult to know just which one is attacking you now. Dominic’s job as an head enforcer is to protect his king at all costs, no matter what. Yet he doesn’t necessarily know who he is protecting the king from, and then in walks Tatiana who just makes his job more difficult by being his one and only mate. Tatiana is similar to many of the other hybrid Amoveo in this series. She doesn’t have a great understanding about life as an Amoveo an fears what it may mean for her. Yet, she cannot avoid the call to heal animals no matter the cost to her. So she tampers her fears and does what she needs to do to help heal the kings horses. I have to say that Tatiana is very much the calm within a storm. She is willing to put everything aside to do what it takes. I have similar traits so this was something I can certainly identify with and made me have a better appreciation for her character. I also loved that she stood up for herself, and was able to hold her own. This was important because the Amoveo world is so male dominated. Dominic’s plight when it came to Tatiana was amusing at times, and at others I really felt for the guy. He is use to having to be the strongest and calculated. Whether it was in the military, or has head enforcer for the Amoveo. Dominic knew what he had to do to get the job done no matter the cost. Tatiana sure did throw a monkey wrench into his life. She creates unpredictability to his life, that he is just not happy about. I loved getting to experience him trying to figure out where his life would lead him now that Tatiana has changed everything. This story has the complex plotline that I have come to expect from author Sara Humphreys. The Amoveos have to deal with both Amoveo and human enemies from various groups looking to eliminate them. This certainly adds depth to the story, as well as some excitement. On top of that the story evolved some additional twist and turns, such as mated couple problems, and traitors that left me on the edge of my seat. 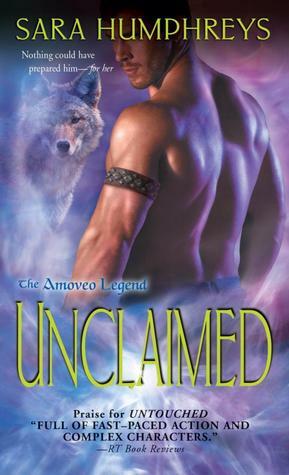 I have recommended previous stories in the series to others, and will continue to do so because Unclaimed was everything I have come to love about the Amoveo world.